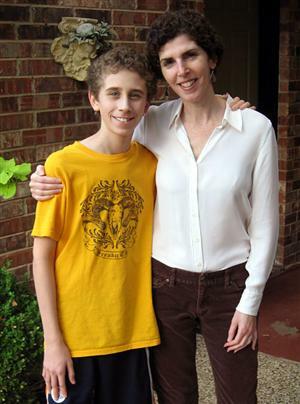 Melissa Shultz, a freelance writer living in Plano, Texas, wrote an article for Newsweek online about her son Nick's mysterious illness and his diagnosis and treatment at Mayo Clinic. Fatigue set in a day after Nick's dizziness started. Swollen glands followed close behind. Our general practitioner ordered blood work, including studies for mononucleosis and Lyme disease. When everything came back negative, we tried steroids for Nick's swollen glands and a round of antibiotics in case he had a bacterial infection. When the dizziness and fatigue persisted we wondered aloud if the culprit might have been the flu shot he received eight days prior. It was presumed he had viral labyrinthitis (an inner-ear disorder) that would pass in a week or two. When it didn't, and his tonsils grew exponentially, we tried a different antibiotic. All the while, he was perched in a makeshift bed on our first floor—an overstuffed chair and aging ottoman with a twin sheet stretched to its limit. Suffering from extreme vertigo, Nick was unable to walk up the stairs to his bedroom. He could not lift his head without looking as if he were drowningand mostly slept the days away. School became someplace his friends went. Read the full story of Nick's experience at Mayo Clinic here. I ended up at Maine Medical and in the hands of the Infectious disease dept. They took a test on my spinal fluid and Ihad severe brain fog and extreme fatigue. will this lead me into another disease?